Though he is better known for his darker pieces, Peter Shaffer had a big hit in the 1980s with this droll dig at the decline of modern standards, and the often opaque ways of the Heritage Mafia, subjects close to The Varnished Culture‘s heart. Once again, Shaffer sets rational Apollo in opposition to romantic Dionysus, this time to richly humorous effect. Miss Lettice Douffet is a tour guide at “Fustian House” in Wiltshire, an ancient pile so dreary and unremarkable that it wouldn’t even get a page in Pevsner. She reacts to her Slough of Despond by commencing an active programme of making-it-up-as-you-go, in which she is a minor hit. She is also adept at parrying the querulous objections and demands for provision of sources to back-up her flights of fancy. But then, along comes Miss Charlotte Schoen from The Preservation Trust, who is not to be so easily diverted. She wants facts, not speeches, and gives Lettice her marching orders, before seeking a rapprochement (of sorts) that leads to drunken revelations, and a friendship based on a shared nostalgia for the historical past (they are Futurists in reverse). 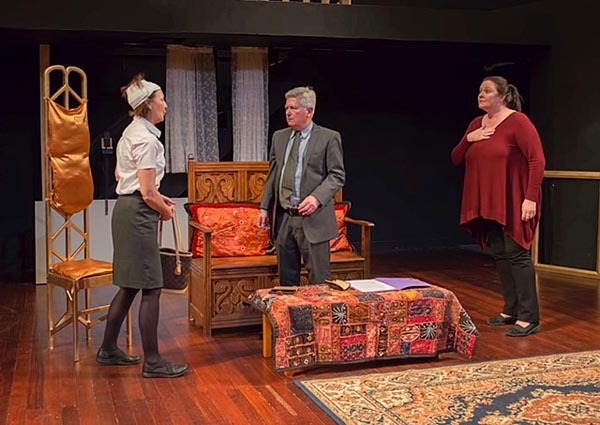 Eventually, Lettice is charged with attempting to murder Lotte with an axe, and petty suburban solicitor, Mr Bardolph, tries to ascertain the facts. But cold hard facts don’t necessarily reveal the truth, and so it is necessary for the two women to inveigle Bardolph into their fantasy world in order for him to gain complete understanding. 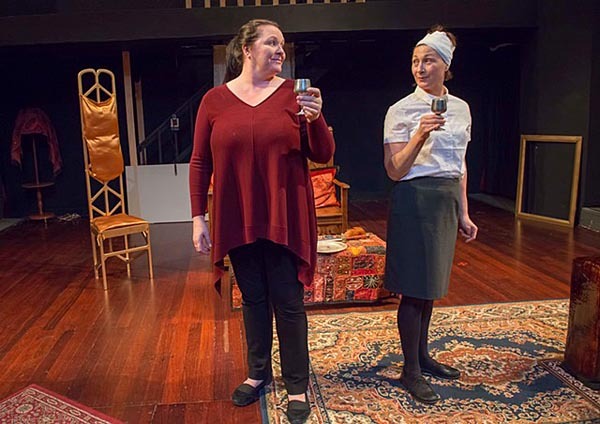 Director Angela Short described Lettice and Lovage as a “light, almost frivolous play but it holds some wonderful insights into relationships.” We find that statement to be true enough as far as it goes. The play works because of its fluffy frivolity and lack of pretension, but it also, of course, depends heavily on solid performances. Tracey Walker as the tragi-comic fantasist, Lettice, reminded us a little of the equally desperate receptionist in The Brittas Empire: all passion, but no reason, all taste, but no talent. With sly digs at provincial rep adorning the walls of her Earls Court flat, Miss Douffet preens, struts and declaims outrageously, giving us a portrayal as absurd, passionate and scarlet as her Mary Queen of Scots body-stocking. Never mind that she chews what little scenery there is – that is the point, and Walker rises to the occasion. Sharon Malujlo plays Lotte Schoen beautifully, so that you can (almost) buy her participation in Lettice’s various historical enactments (which of course are, perversely, alarmingly real). When in Act II she gets tipsy and starts mimicking her stern Teutonic father, the result is snort-inducing, laugh-out-loud farce. Malujlo somehow manages to convey the unlikely transformation of a beleaguered, dry bureaucrat into a joyous free spirit, and so hers is surely the turn of the night. Jack Robins as Mr Bardolph has far too thin a file for our liking – wouldn’t a brief in an attempted murder case be bulkier? But his confused and tetchy air is soon turned into the delighted enthusiasm of the amateur neophyte – you can imagine him signing-on to one of Lettice’s Tower Bridge tours – and his playing nicely enhances further the link between the two ladies. 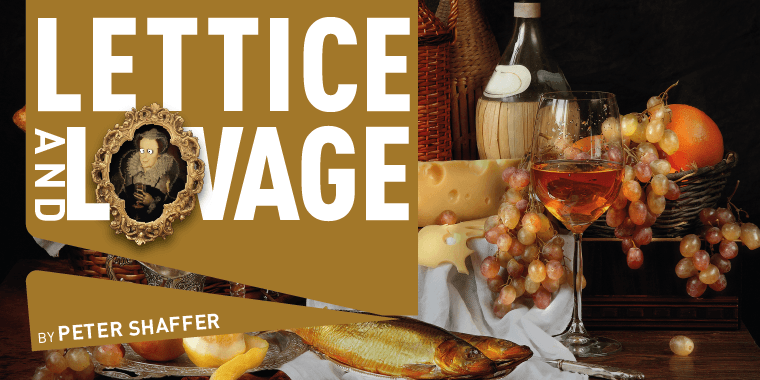 All in all, we would have to say that Lettice and Lovage is the piece The Varnished Culture is least apt to like. But we had a great time. Although it is a bit like sampling chilled champagne and blue cheese at the same time, the whole confection works, and in this production, it worked very well.